The FT-9 has "Hyperbolic Face Technology" and "Fusion Technology." The HFT is a state-of-the-art design giving the driver tremendous ball speeds across the entire club face. The Fusion Technology enhances perimeter weighting by fusing a carbon composite body with a titanium face cup. This provides a precise positioning of the center of gravity and a "GI-NORMOUS" sweet spot for more stable off-center shot. The best thing about the FT-9 is the workability plus the toned-down sound. 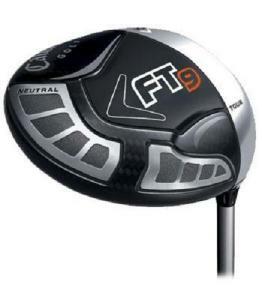 With most of the modern large-headed drivers, I can't easily work the ball with a fade or a draw, but the FT-9 is a shot makers club that is designed for creative shot making. What's more is, it doesn't have that annoying "tink" sound that I associate with these new drivers. I would recommend this driver for the low handicapper that is looking for the best of both worlds: a big headed driver with a huge trampoline effect that also provides some workability.